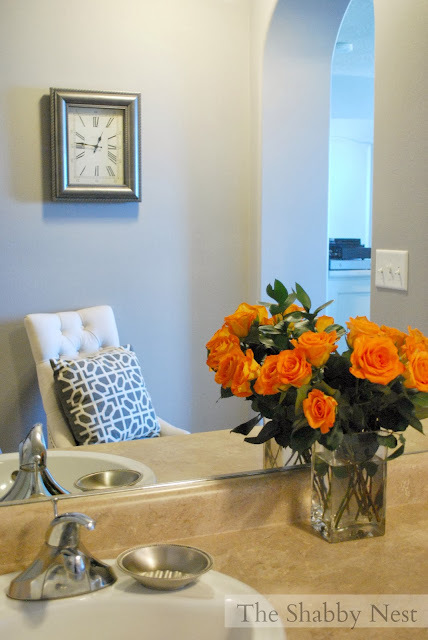 Today I wanted to share my master bath makeover with you! This has been a long time in coming mostly since my master bath is such an awkward space I simply couldn't decide what to do with it. The room is basically a long hallway with a vanity, shower/tub combo and water closet on one side and the master closet at the end. 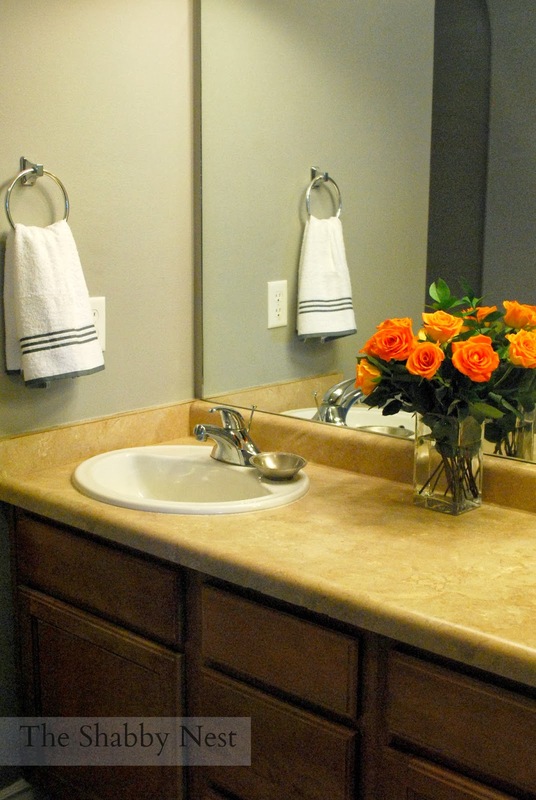 And as most of you know already, I'm renting, so the flooring and the cabinetry had to remain the same. What's a girl to do when she wants to update the bath then? Well, the biggest change I made was to add paint...of course! And the color I used is the same as the color in my master bedroom (reveal of that room coming up very soon.) It is Stonewall Jackson by Dutch Boy. I really like this gray because it is more of a true gray without either too much blue or too much yellow. It's very soothing and changed the feeling of the space immediately. 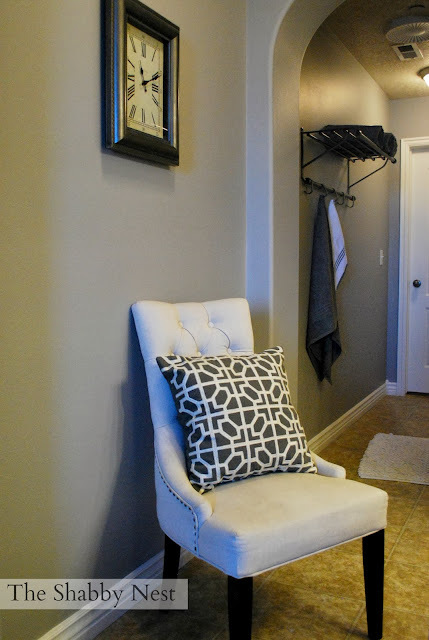 Then to up the comfort factor, I added a chair and pillow to the vanity space. I also added a clock. A clock, you ask? Well...it's a pretty clock. And it helps me make sure I'm ready in time in the morning. I'm nothing if not practical. 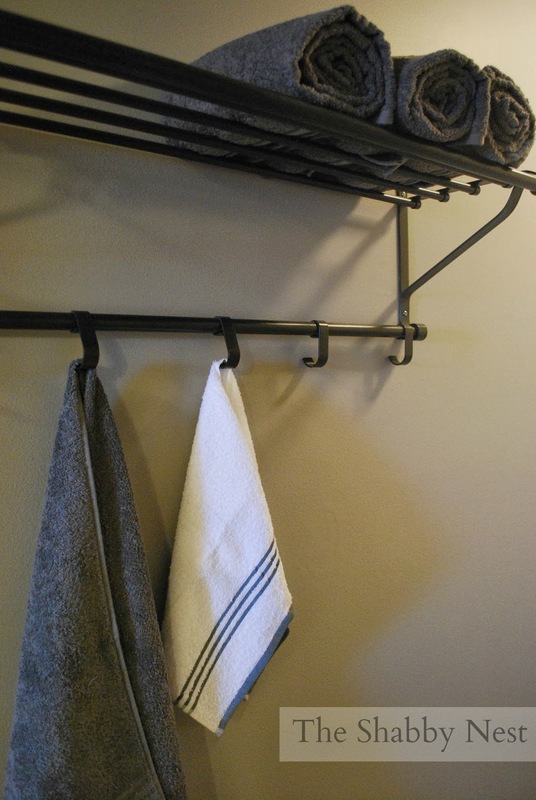 I also added this cute IKEA rack to hold my towels. It was a $5 find in the as-is section of IKEA because the hooks are backwards. It works for my purposes though, so I snagged it. 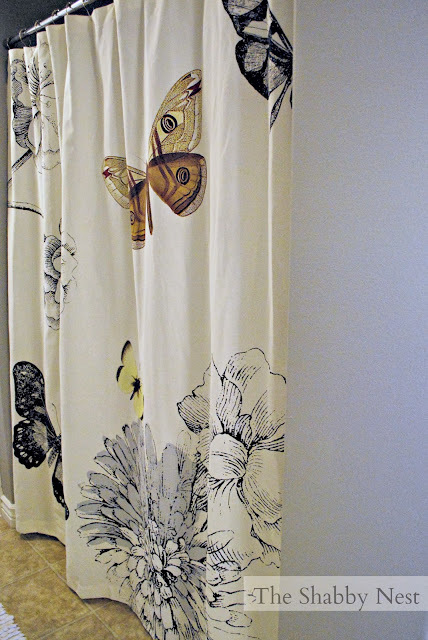 You may recall a couple of weeks ago when I posted my shower curtain dilemma. 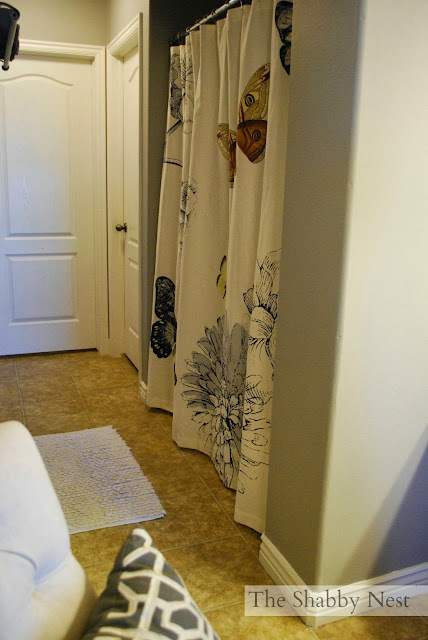 Well, like most of you who weighed in on the matter, I was leaning heavily toward the yellow and white striped shower curtain until I got the paint on the walls. Then the other curtain became the obvious choice. And I just love it in the space. 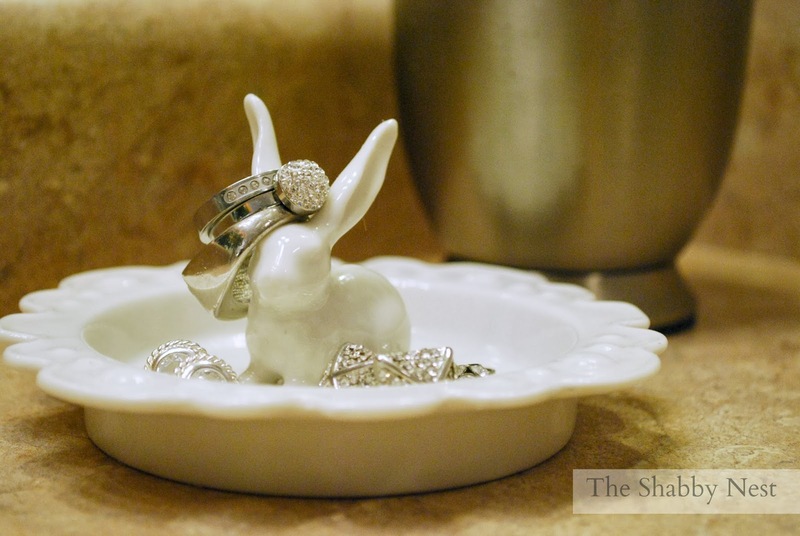 Of course, I had to add a little fun to the space with pretty flowers, and my Anthropologie rabbit ring holder. I topped it off with some fluffy towels and "voila!" I had a lovely space with a brand-new feel. love all the details! Great job! Love the new look and can't wait to see your bedroom! I love how you make your rental home so beautiful!! If you unscrew the end cap of the hook rod, you can flip it around and the hooks will be facing the right direction! :) That's what I love about IKEA! Almost everything comes apart!